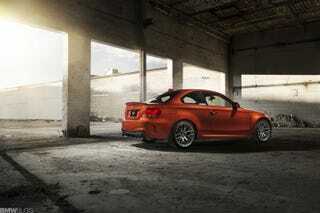 BMW 1M gets its first big screen appearance. "The Gambler" features Mark Wahlberg who plays a literature college professor. And a high-stakes gambler. Bennett bets it all when he borrows from a gangster and offers his own life as collateral. Always one step ahead, Bennett pits his creditor against the operator of a gambling ring and leaves his dysfunctional relationship with his wealthy mother in his wake. He plays both sides, immersing himself in an illicit, underground world while garnering the attention of Frank, a loan shark with a paternal interest in Bennett's future. In the official trailer seen below, we can spot the BMW 1M at 1:21 minutes and 1:54 minutes. And to make things even better, the Valencia Orange 1M is the chosen one. Being a limited edition and not sold currently on the new car market, the 1M was not a product placement by BMW North America. According to a source based in California, the 1M was up for sale on eBay, it was noticed by the movie studio who offered $15,000 to "rent" the car for 3 months.